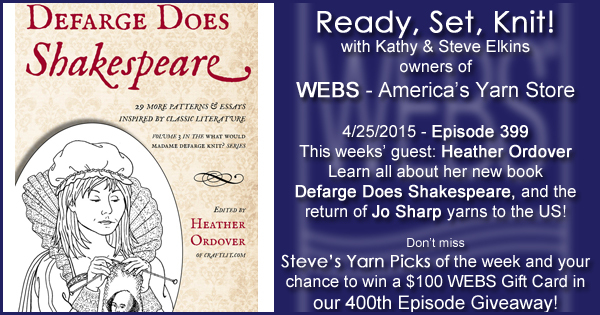 This week Kathy talks with returning guest Heather Ordover, author and podcaster, about her CraftLit podcast and her latest book, Defarge Knits Shakespeare. Heather and Kathy talk about the Mme Defarge series of books and the process of pulling together the projects for the newest book (check out all the designs on Ravelry). Some of the projects are for advanced knitters but there are great patterns for the newest beginners as well! Jo Sharp yarns! available exclusively at yarn.com! with great pattern support. Be sure to comment on this post and tell us how long you’ve been listening to Ready, Set, Knit!, and don’t forget to include the hashtag that Kathy mentions in the show! Comments will close at 11:59pm EDT on Tuesday April 28th, and a random commenter will be chosen to win a $100 WEBS Gift Card. Be sure to listen to the show next week when we’ll reveal the last winner! We’re in the last week of the April Anniversary Sale – grab these yarns while you have the chance! Mark your calendars, WEBS Tent Sale is happening May 16th and 17th, and don’t miss the 11th Annual Fleece Market on May 16th! Classic Elite Yarns Trunk shows are ongoing and there’s always something new to see! Stop by the store to see what’s on display. Be sure to check out all of our upcoming Events here. This entry was posted on Saturday, April 25th, 2015 at 9:00 am	and is filed under Ready, Set, Knit Podcast. You can follow any responses to this entry through the RSS 2.0 feed. You can skip to the end and leave a response. Pinging is currently not allowed. I’ve been listening since shortly after I joined Ravelry in 2011. I joined the “All Things WEBS” group, discovered the podcast, and the rest is history! When I was at the tent sale a couple of years ago out in the warehouse I heard *familiar voices*. I wanted to go over and say hello, but didn’t want to be a nuisance on such a busy day. Anyway, here’s to #8years of podcasting and many more to come. Congratulations on #8years of your podcast ! I started knitting one year ago . I discovered the Webs store and podcast last fall . I’ve enjoyed your podcasts and I’ve learned a lot from them. Cheers to the next 400 episodes ! I have been listening since the first Sock Summit in Portland, Oregon, including some road trip episodes. I try to shop local, but I sometimes take advantage of your fabulous sales. And I turn to WEBS when I can’t find what I want locally, so thank you for being there! I like your podcast for keeping me up to date on new yarns and publications. I hope you continue for many more than #8years! I have been listening for 7 years of the #8years of your podcast. I had to look back at my Ravelry account to figure out when I returned to the world of knitting. I cannot believe you opened your store the year after I graduated from Smith! You expect me to remember something that happened #8years ago? Geez! The podcast has become my lifeline to WEBS since I moved from NE 5 years ago, but I’m pretty sure I found it a year or two before that. I don’t remember when I started listening but Pixie was on and I loved her! You were the first podcast I listened to and just loved it and I remember going back and listening to some of the earlier ones, too. Thank you for #eight years!! I’m going to guess about 2.5 years, although it’s probably much more because time is flying by. Congratulations on #8years and 400 episodes. Quite the milestones! I have been listening for at least 5 years, but it’s a bit hazy because I went back as far as I could to listen to all the older ones. Congratulations on #8years! I did love the KALs and am wondering if Kathy ever finished her chicken? Hi Kathy and Steve! I’ve been listening for most of your #8 years. I too miss Pixie, as others have said. Always something to learn from the great folks you interview and what’s not to love about yarn deals? Here’s to 400 more. Thanks for shows. I’ve listened to all the episodes! Can’t believe it’s been #8 years! 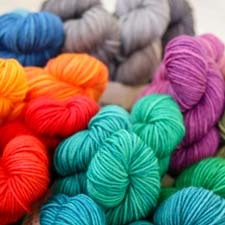 I always learn something from your guest interviews and I appreciate your insights into the yarn business. I just recently discovered the podcast; but with #8years of episodes, I should be able to listen for some time! Congratulations on 400 episodes. I have been listening to your podcast for several years. It is always interesting to listen to the great guests you bring to the show. I have also benefitted from Steve’s description of new yarns. He almost always makes an observation or connection that brings a brighter light to the yarn and how I might match it up to patterns I’ve yet to knit. Congratulations on 400 episodes! This is an achievement to respect and celebrate. Brand new listener here! Congrats on 400 podcasts!!! That is no small feat! I’ve been listening almost all of those #8years, as I started listening about seven years ago, shortly after I picked up knitting again after a long hiatus. I love the interviews, and Steve’s yarn picks of the week have certainly resulted in additions to my stash. Best wishes on episode 400! Well, I think I have been listening for over two years. I know it was when I got Bluetooth in my car so I could listen while I was driving! I wonder how long it would take me to go back and listen to all the episodes of the last #8years and catch up? Congratulations and here’s to eighty more! I haven’t been listening for all #8years, but it must be close. I have stash from Webs older than that. Let’s hear it for #8moreyears! Congratulations on #8years! I’ve been listening for about a year and a half. Loved all the stories about how WEBS began. I have been listening to your podcast since I started listening to podcasts about 4 years ago. They really made the long commute I used to have with my old job enjoyable. Congrats on 400 episodes and #8years. In comparison to some of the lovely comments before, I’m a relatively new listener – only about a year of the past #8years you have been putting these shows out. Thank you so much for the interviews you put out with a variety of industry people, they are always so much fun to listen to! Congratulations on your 400th episode, here’s to 400 more. I have just discovered you! I’ve never been more thankful for archives. Thank you for putting together a well produced, coherent, informative show. I’ve been “auditioning” podcasts and with the single exception of yours, I have been horrified. Is that too strong? How about disappointed? I am so happy to have found you. #8years and going strong!! (I know I’m past the entry time, but I wanted to extend congratulations anyway). Although I’ve been a customer and HUGE fan of Webs for more than 10 years, I’ve just discovered your podcast. How did THAT happen?! So glad to have connected. Congrats on your anniversary. Looking forward to the next #8years!